A magnificent musical providing a night of pure theatrical magic – and, to be honest, that’s all you really need to know. Theatre can never be perfect, but this gets pretty damn close. Now in its 34th year it is still as fresh, powerful and mesmerising as ever, still playing to full houses, still rewarded with standing ovations, still finding new names to bring it's well known characters and much-loved songs to life. It is based, loosely, on Victor Hugo’s 1862 classic novel of the same name, leading up to the short-lived 1832 June Rebellion in Paris, which becomes the dramatic climax of the musical. 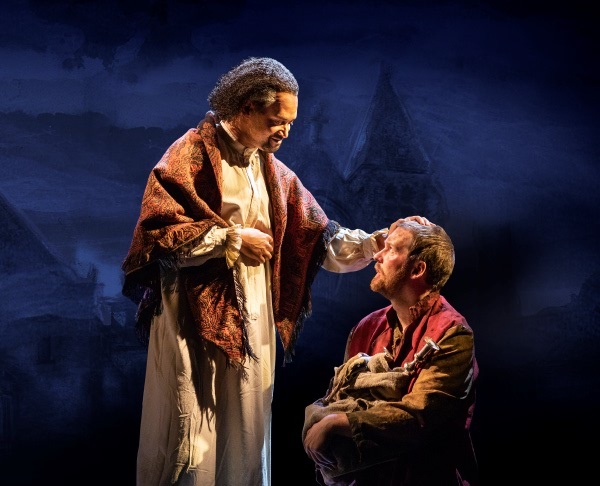 That is until The Bishop of Digne, sung well by Scottish baritone Brian James Leys, shows him kindness and an alibi, after he has nicked the right rev’s silver, and sets him on the road to salvation. Years later we see him reinvented as Monsieur Madeleine, factory owner and mayor of Montreuil-sur-Mer, a pillar of society – except he has broken his parole and his onetime jailer, now police inspector, Javert is obsessed with finding 24601 and putting him back behind barsl. Nic Greenshields is superb as the driven Javert, with a deep, powerful rich baritone full of anguish and despair. His Stars has a delightful lightness of touch while his suicidal Soliloquy is full of raw power and torment, raising hairs on the back of the neck. Katie Hall excels as Fantine, cruelly sacked by Valjean’s lecherous factory foreman (Jordan Simon Pollard) and is reduced to being a street whore to send money for her child Cosette’s keep. Her bittersweet I dreamed a dream is always a highlight and here it is beautifully sung. It is a case, incidentally, of daughter to mother. In the 2009 production Hall played the role of Cosette. 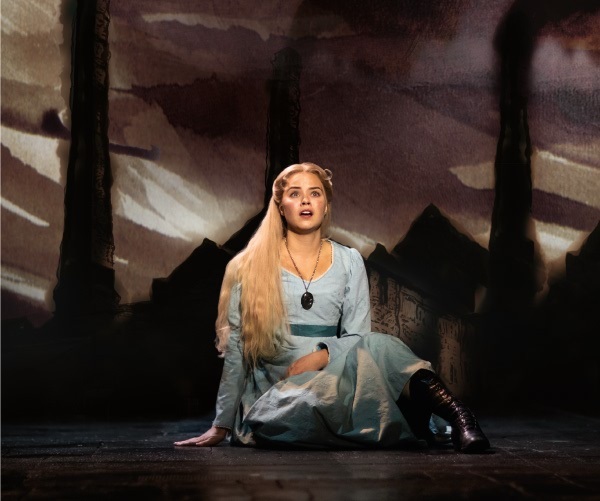 A decade on and it is Bronwen Hanson in her first major professional role as a lovely Cosette, the child, now a woman brought up by Valjean, honouring a promise made to Fantine as she died. Until then she had been looked after, barely, and at a huge profit, while treated as skivvy, by the Thénardier’s, a delightfully comic turn from Martin Ball and Sophie-Louise Dann. The pair run an inn duping, conning, robbing, and generally relieving anyone foolish enough to enter of their money, hats, watches . . . , oh, and whatever you do, don’t touch the wine – watch the show and you will find out why. The pair are an explosion of vulgar, over the top fun, comic swindlers with their signature Master of the House. Their spoiled daughter Éponine is virtually abandoned to the streets as the pair move into Paris with a criminal gang. Tegan Bannister sings the part with real emotion. She has fallen for the young student Marius, but he has fallen for Cosette – love at first sight. He sees Éponine as a friend, a mate even, and you really feel for her with her sad, touching love song On My Own, beautifully sung, full of emotion, and given some real wellie. What a voice this girl has! Marius is the idealist, revolutionary student, sung by Harry Apps, remarkably in his first professional role. Without the programme notes you would never ever guess it; it is a polished, confident performance in a role first sung by Michael Ball back in 1985 – and he did OK out of it. I suspect we will be seeing Mr Apps again. His sad song of lost friends and lost dreams Empty Chairs at Empty Tables is sung with real emotion and a fine tenor voice. It is a song of loss that perhaps stirs thoughts beyond the footlights. Marius is the reason Valjean joins the revolution, to protect him for Cosette which gives Donnelly his own song to send shivers down the spine, Bring Him Home, written for the original 1985 Valjean, Colm Wilkinson, I am told after the musical’s composer Claude-Michel Schönberg heard Wilkinson exercises warming up in his dressing room. It is not the easiest of songs, demanding an excellent range and ability to sing the high notes, clearly and quietly, almost as a countertenor. The prolonged applause said it all. Another show highlight. Cosette, Éponine, Valjean and Marius are involved in some fine duets, trios and quartets in the likes of In My Life and A Heart Full of Love while the chorus work is quite outstanding, operatic standard. 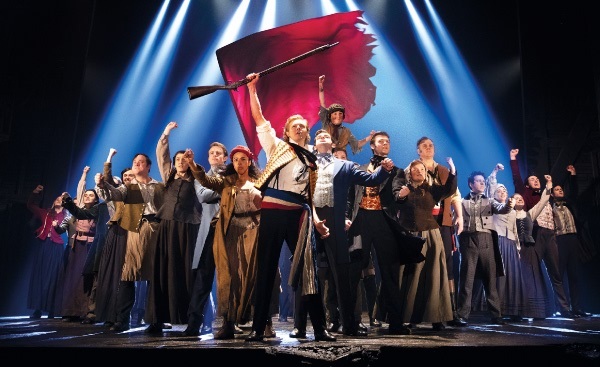 There is good support from Will Richardson as Eljolras, the student revolutionary leader, with a plan high on ideals and short on future, who leads the rebel band in the anthems Red and Black and Do You Hear the people sing? Then there is Belgian baritone Ruben Van keer as the drunken Grantaire, a student with no revolutionary zeal who is there only because his friends are there; he asks, tellingly, as the final battle looms, whether any of them think their deaths will achieve anything. He leads the poignant Drink With Me To Days Gone By. The ensemble who pop up as prostitutes, inn customers, townsfolk, chain gang, wedding guests and the great unwashed do a sterling job, with plenty of costume changes and the produce some magnificent choral work, to add to the richness of the production. Paule Constable’s lighting is quite masterful, with pencil spots and follow spots, at times singly, picking out scenes, characters and moments, the white light stark in the smoky atmosphere surrounding Matt Kinley’s setting with fly high walls sailing slowly on stage like rotting hulks to join creating the back streets of the Paris slums, or the barricades, factory or street scenes gliding in and out of the wings with not a single break in action. A mention too for the lighting operators who have to cope with a mind boggling 518 cues – that’s an average of one every 19 seconds! Then there are the back projections based on Hugo’s paintings, changing scenes by a fade in or out, all helped by Mick Potter’s sound design, which gives us clear as a bell singing and deafening gun battles. Andreane Neofitou ad Christine Rowland’s costume designs – there are 392 of them – look authentic, which is what matters and directors Laurence Connor and James Powell manage the near 40 cast wonderfully, adjusting the pace to the action and handling crowd scenes with great skill, you want revolutionaries or angry crowds to look like mobs – not to actually be one. Each person had a role and helped create the scene. Add to that a 15-piece orchestra under musical director Ben Atkinson and you get the sort of full, symphonic sound that Alain Boubil and Schönberg’s music deserves. The musical, adapted from the French concept album by Trevor Nunn, produced by Cameron Mackintosh and The Royal Shakespeare Company, opened in 1985 to mixed reviews; some critics saw it as lightweight, too formulaic, too sentimental – maybe the real critics though, are the paying public. We say what we think - they buy what they like! It has become a firm favourite, second longest running musical in the world, second only to the 42 year run of the Off-Broadway musical The Fantasticks which closed in 2002. It has been seen by more than 70 million in 44 countries and 34 years on is still packing them in all around the world. 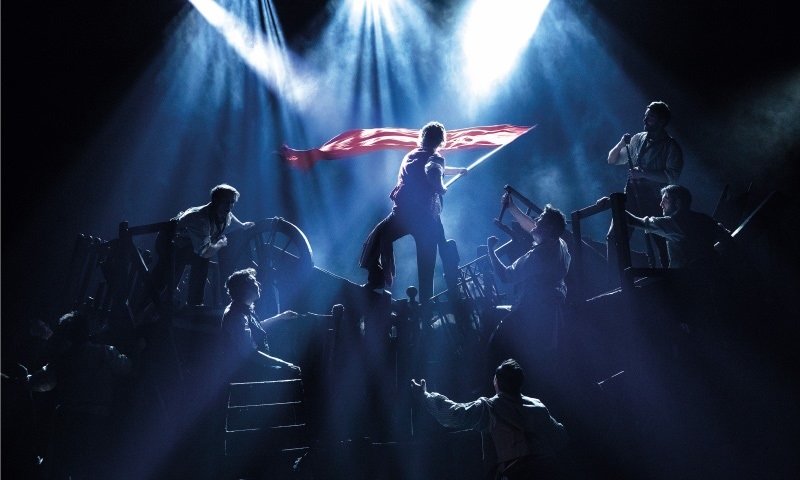 Les Misérables started life as a French concept album and was turned into a stadium show in Paris in 1980. The album was given to Cameron Mackintosh and the rest is history. It was adapted for the English stage, songs were changed or added and it has evolved, taking on board new techniques and technologies and new ideas. But it still owes it’s origins to that French album of 1980. It’s available to download or can be streamed on the likes of Amazon Prime or Spotify. Worth a listen for Les Mis fans.